The WANLONGXIN front panel's materials and accessories are all equipped with high-quality material. And the cables can also be clean and beautiful in the computer box. It has build-in USB 3.0 Port, e-SATA, SATA port, 4 pin IDE Power port or DC 12V, Audio, Multi Card Reader, which can command your needs. And it will make your desktop computer show multi-function, high performance, and fashion. 1. 2 USB 3.0 Hub(Host), transfer speed up to 5.0Gbps,downward is compatible with USB2.0 and USB1.1. 6. Audio ports: front speakers and microphone. It solves the inconvenience of the plug behind your chassis. 7. All-in-one Card Reader: Support SD / MMC / CF / MS / TF / M2, At the same time Card reader can only read one memory card. *At the same time, Card reader can only read one memory card. *When the computer can not shut down, unplug the 4-pin power cord connected to the computer, can be resolved. Because some computer motherboards in the shutdown will also appear after the return of the phenomenon, leading to not immediately shut down. 4pin power connector is to pay attention to the direction of connection, otherwise it will cause a short circuit, the product map has the correct link method. The WANLONGXIN front panel media dashboard is made of ABS material and etched on surface. It is stable with high speed and safety. It is durable as well as beautiful. It is anti-rust and hard to be scrapped. 20Pin Interface. 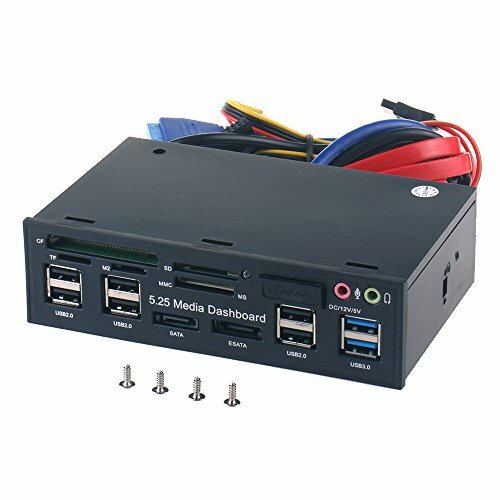 It has build-in USB 3.0 Port, USB 2.0 port, e-SATA, SATA port, 4 pin IDE Power port or DC 12V, Audio, Multi Card Reader, which can command your needs; Power 12V/5V output. Note: 4pin power connector is to pay attention to the direction of connection, otherwise it will cause a short circuit, the product map has the correct link method. 2 USB 3.0 Hub(Host), transfer speed up to 5.0Gbps; 6 USB 2.0 Hub, transfer speed up to 480Mbps; e-SATA port, the transfer speed up to 3.0Gbps; SATA Port, the transfer speed up to 1.5Gbps. All-in-one Card Reader: Support SD / MMC / CF / MS / TF / M2, At the same time Card reader can only read one memory card. WARRANTY: We promise 1 year limited warranty and worry-free lifetime technical support by WANLONGXIN. If you have any questions about this product by WANLONGXIN, contact us by completing and submitting the form below. If you are looking for a specif part number, please include it with your message.